SMU was not a popular pick to make noise in the American Athletic Conference Tournament. The Mustangs had lost eight of their last nine games and were manhandled by last-place South Florida in their regular season finale. When the dust settled in Orlando Tuesday afternoon, SMU defeated UConn in its conference tournament opener 80-73. In a rollercoaster ride of a game, the Mustangs saw their 21-point second-half lead fall to four in the game’s final minute, but they pulled out the win with clutch free throw shooting. SMU came out of the gates red-hot. The Mustangs led 42-23 at halftime, thanks to an impressive all-around effort. Jahmal McMurray was dynamite, stroking five jumpshots in a 12-point first half performance. “In the first half, I thought our purpose and our ball movement and our concentration offensively was really outstanding,” Tim Jankovich said. After halftime, UConn awoke from its slumber. The Huskies kicked off the second half with a 12-2 run, cutting SMU’s lead to nine in less than four minutes. Before they were able to pull any closer, SMU stemmed the tide. The Mustangs answered UConn with an 11-0 run keyed by intense defense and lights-out shooting. SMU got its points off of two jumpshots each from McMurray and Emelogu. On the defensive end, the top of SMU’s zone was active, as Elijah Landrum and McMurray compiled three steals on the run. SMU eventually extended its lead to 21 points, but UConn was not done. 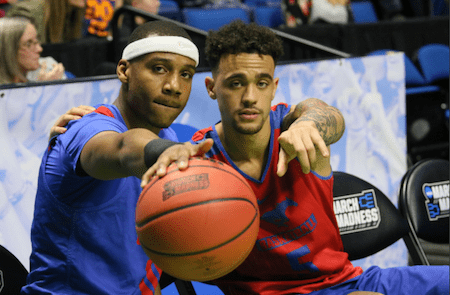 The Huskies used an energetic full-court press to stymie SMU’s offense and trailed by four points after Antwoine Anderson drilled a 3-pointer with 40 seconds left. The Mustangs held on with clutch free-throw shooting, making seven of their eight free throw attempts from that point to ice the game. Emelogu made five of those late shots from the charity stripe. With his season and college career on the line, nerves were not a factor. Agau and Emelogu were SMU’s best players in what would have been their final game with a loss. Emelogu scored a team-high 23 points and hauled in eight rebounds. Agau scored a career-high 21 points on an efficient eight shots. SMU got a big boost with its 3-point shooting. The Mustangs made 10 of their 27 shots from behind the arc, while the Huskies made just four 3s on 25 percent shooting. Late in the game, Agau blocked a shot and came down on UConn guard Christian Vital, tweaking his ankle. Agau limped off the court, but said he would be available for tomorrow’s game. The win was SMU’s seventh-straight in the AAC Tournament, as the Mustangs won the tournament the last two years they competed in it. With the win, SMU improves to 17-15 on the season. Next, SMU has No. 8 Cincinnati, who won the AAC regular season and will be looking to avenge last season’s conference tournament loss to SMU. That game tips off at 11 a.m. CT tomorrow.